Like B159b, but new date (2015). Prefix AP. Like B155d, but new date (2019). Prefix CE. Like B158c, but new signatures and new date (2017). Prefix BF. Like B157d, but new date (2017) and new signatures. Prefix BP. Like B159c, but new date (2017) and new signatures. Prefix AS. Like B156d, but new signatures and new date (2017). Prefix BK. Like B158b, but new date (2015). Prefix AX. Like B157c, but new date (2015). Prefix BA. Like B140c, but new date (1997). Prefix HL. B154d: Like B154c, but new date (2015). Prefix BY. B154c: Like B154b, but new date (2014). Prefix BT. Like B156c, but new date (2015). Prefix AW. Like B155b, but new date (2015). Prefix BG. 20,000 shillings, 2013. Like BOU B58, but new date. 2,000 shillings, 2013. Like BOU B55a, but new date. Prefix AY. 1,000 shillings, 2013. Like BOU B54a, but new date. Prefix BN. 50,000 shillings, 2013. Like BOU B59, but new date. Prefix AM. 10,000 shillings, 2013. Like BOU B57, but new date. Prefix AU. 5,000 shillings, 2013. Like BOU B56, but new date. Prefix AS. According to a press release dated 6 December 2012, on 1 April 2013 the Bank of Uganda will revoke the legal tender status of all notes printed before 2010, though such notes can still be exchanged for 2010 series notes at bank branches until the end of 2013, at which time they will be demonetized. 5,000 shillings (US$2.10), 2011. Like BOU B56 (P51), but new date. 10,000 shillings (US$4.05), 2011. Like BOU B57 (P52), but new date. The Uganda chapter of The Banknote Book is now available for individual sale and as a free download to subscribers. This 20-page catalog covers notes issued by the Bank of Uganda from 1966 to present. Revised 15 July 2016. According to an UGPulse article, Governor Emmanuel Tumusiime Mutebile said the Bank of Uganda would consider introducing a 100,000-shilling (US$38.50) banknote if inflation doesn’t ease from recent levels around 30 percent. Currently the largest denomination is the 50,000-shilling note issued on 17 May 2010. In a follow-up statement dated 11 November 2011, the Bank of Uganda clarified that it is not contemplating and has no immediate plans to introduce a 100,000-shilling note and that the bank has no intention of changing its currency structure at the moment. The International Bank Note Society’s (IBNS) ‘Banknote of 2010’ is Uganda’s 50,000-shilling note. This year, for the first time, the award was decided by a popular vote by members of the IBNS, rather than by a committee, and the award shows a strong appreciation of the 50,000-shilling note among a large community of banknote enthusiasts. From thirteen nominations, voting indicated a strong preference for the Ugandan note from the time voting was made available to members on the IBNS web site (www.theIBNS.org) in mid February. The highest denomination in a series of six notes introduced in May 2010, the 50,000-shilling note has strong design elements consistent with the series. These elements include the watermark of the head of a crested crane, an outline of a map of Uganda (highlighting the equator), the profile of man wearing Karimojong head dress, patterns based on indigenous basket work and, at the far right on the back, the Independence Monument. Erected to celebrate Ugandan independence in October 1962, the statue is of a woman wrapped in bonds lifting a child above her head, celebrating the birth of the nation. On the front of the award-winning note the ‘Stride Monument’ is at the left, the Bwindi tropical rain forest is illustrated at the centre left, a foil strip with the denomination and images of shields at centre right and an area for the watermark at the far right. The Stride Monument was erected to celebrate the Commonwealth Heads of Government Meeting held in Kampala in 2007. Depicting a husband, wife and son stepping forward, the monument symbolizes the countries of the Commonwealth progressing as a family. The back of the note is dominated by illustrations of silver back mountain gorillas and undoubtedly these amazing animals attract people to the notes and their depiction is one of the reasons the 50,000-shilling note was so popular amongst the IBNS members voting for the award. Apart from the gorillas, there is much which is attractive about the note, such as the good use of colour – particularly the brown, which might have made the note appear dull if used inappropriately, and the golden highlights which capture attention. Strong images, well depicted, add to the quality design of the note and good use of security features for a high-denomination note enhances the overall effect. Printed by British security printers De La Rue, the note was designed in co-operation with the Bank of Uganda. This successful collaboration has seen an impressive series of banknotes introduced to Uganda and it has produced the award-winning note in the competition for the IBNS Banknote of 2010. The IBNS congratulates the Bank of Uganda and De La Rue for its achievement. An East African Business Week article dated 14 February 2011, contains interesting information on the continuing plans to form an East African Community Monetary Union similar to the European Union, wherein all the partner states will replace their individual currencies—the Burundian franc, Kenyan shilling, Rwandan franc, Tanzanian shilling, and Ugandan shilling—for a single regional currency in 2012. According to an article on Daily Monitor dated 30 December 2010, the Bank of Uganda used an image of a sculpture on the front of the 20,000-shilling (US$8.60) note issued 17 May 2010 without the permission of its creator, Sylivia Nabiteeko Katende, a senior lecturer at the Margaret Trowel School of Industrial and Fine Art at Makerere University. The artist is suing the bank for over 1 billion shillings (US$430,000), for fraudulent use of her intellectual property. Ms Katende claims she created the sculpture, named the Socio Economic Growth of Kampala City, to commemorate the city’s centenary celebrations in 2000. 5,000 shllings (US$2.30), 2009. Like Pick 44, but new date and new signatures (Emmanuel Tumusiime Mutebile and Chris Manyindo Kassami). All notes are signed by Emmanuel Tumusiime Mutebile and George W. Nyeko. On 3 May 2010, Bank of Uganda unveiled a new series of redesigned and smaller banknotes which will go into circulation on 17 May. The new notes are in the existing denominations of 1,000, 5,000, 10,000, and 50,000 shillings, as well as a new denomination: 2,000 shillings (US$0.95). Besides a harmonized banknote design that depict Uganda’s rich historical, natural and cultural heritage, the new notes bear improved security features and are smaller in size than the existing series which will remain legal tender. The common security features for the 1,000-, 2,000-, and 5,000-shilling notes are a watermark, a color-change image, and a raised effect on the surface to help the visually-impaired people differentiate denominations. The notes also feature a windowed thread that changes from red to green when the note is titled. The notes also bear a hidden irridescent pattern. The bank hired professional artists and designers led by Gen. Elly Tumwine which explains the Ugandan look as depicted by the main images which constitute pots and ornaments common in Ugandan homes. The notes were printed by De La Rue, the world’s largest commercial security printer. Bank of Uganda chief Emmanuel Tumusiime Mutebile said the new notes did not constitute a currency reform, nor were they dictated by politics. The redesign, he said, was driven by the need to comply with international practices and to beat counterfeiters. “Uganda is the first country in Africa to introduce ultra –modern security feature called SPARK,” an optical security feature from KBA-GIORI first used on Kazakhstan’s 5,000-tengé commemorative of 2008. Courtesy of Ny Andry Ranaivosolo and Tuyet Nhung- Dieter Eheim Le. 20,000 shillings (US$10.65), 2009. Like Pick 46, but new date and new signatures. The Bank of Uganda is reported to have issued new 50,000-shilling notes dated 2009. On 27 August 2009, the Bank of Uganda announced that it would introduce a 1,000-shilling (US$0.50) note with a modified serial number format on 1 September 2009. The notes are like the current note of the same denomination (Pick 43), except that they carry serial numbers with a single prefx letter followed by seven digits, instead of the preceding two-letter prefix followed by six digits. According to Raimondi Otim, deputy director of the currency department at BoU, “This is just a slight change in the numbering only, but the security features and the colurs of the notes remains the same. This development does not mean that the old Shs1,000 banknotes have ceased to be valid. The new Shs1,000 banknotes will be in circulation alongside the old banknotes,” he said. Like Pick 45, but new date (2009). P.S. Be aware than the 15th edition of the SCWPM incorrectly includes the 2004-dated note as Pick 45a when in fact it is a variety of Pick 41. The difference between the two types is evident when examining the denomination in the lower left front. Like Pick 43, but new date (2008) and new signatures (Emmanuel Tumusiime Mutebile, GOVERNOR; Chris Manyindo Kassami, SECRETARY). Green and brown. Front: Farmer with hoe; coat of arms; corn stalks; bank emblem. Back: Two trucks; grain elevators. Holographic stripe. Solid security thread with demetalized 1000. Watermark: Crested crane. Printer: Unknown. 150 x 75 mm. Like Pick 44, but new date (2008) and new signatures (Emmanuel Tumusiime Mutebile, GOVERNOR; Chris Manyindo Kassami, SECRETARY). Violet. Front: Lake Bunyonyi and terraces; silver foil leaves; coat of arms; leaves; bank emblem; equator monument near Masaka. Back: Railroad cars and Kaawa ferry; coffee bush. Holographic stripe. Solid security thread with demetalized 5000. Watermark: Crested crane. Printer: Unknown. 150 x 75 mm. Like Pick 45, but new date (2008) and new signatures (Emmanuel Tumusiime Mutebile, GOVERNOR; Chris Manyindo Kassami, SECRETARY). Green and red. Front: Musical instruments; coat of arms; bank emblem. Back: Owen Falls dam and Nalubaale Power Station in Jinja; kob (antelope). Holographic stripe. Solid security thread with demetalized 10000. Watermark: Crested crane, electrotype 10000, and Cornerstones. Printer: TDLR (w/o imprint). 156 x 76 mm. Like Pick 46, but new date (2008) and new signatures (Emmanuel Tumusiime Mutebile, GOVERNOR; Chris Manyindo Kassami, SECRETARY). Green. Front: Crested crane; coat of arms; bank emblem. Back: Parliament building in Kampala. Holographic stripe. Solid security thread with demetalized 20000. Watermark: Coat of arms. Printer: Unknown. 160 x 78 mm. Like Pick 47, but new date (2008) and new signatures (Emmanuel Tumusiime Mutebile, GOVERNOR; Chris Manyindo Kassami, SECRETARY). Brown. Front: National Independence monument in Kampala; coat of arms; bank emblem; pineapple. Back: Four workers picking cotton in field. Holographic stripe. Solid security thread with demetalized 50000. Watermark: Coat of arms and electrotype 50000. Printer: Unknown. 160 x 80 mm. Courtesy of Andrew Roberts and others. Please post a comment or send me an email if you can positively identify any of the buildings on the back of Uganda Pick 29 above. Lower right: New Bank of Uganda headquarters. Lower left: Old Bank of Uganda headquarters. On 16 October 2007, allAfrica.com reported that the Bank of Uganda intends to issue a special 10,000-shilling (US$5.75) note ahead of the Commonwealth Heads of Governments Meeting (CHOGM) scheduled to take place in Kampala, November 23-25, 2007. “The note will be available for the public to transact business and for special collectors. It will, however, be in limited supply,” said Juma Walusimbi, BoU communications director. “The currency note will also be a special package offered to the heads of government who will attend CHOGM. 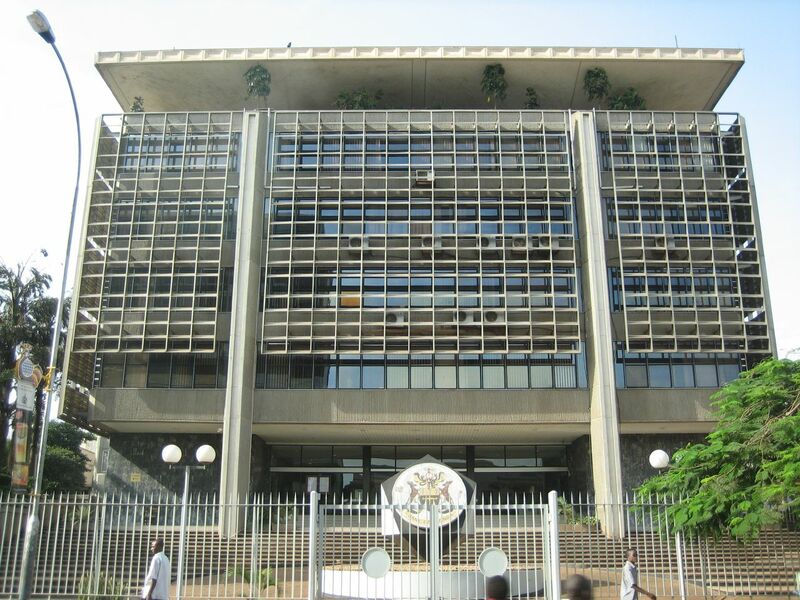 The bank wants to be part of Uganda’s effort to host this very important international meeting,” he said, adding that it was normal practice for central banks to issue commemorative coins and notes for important occasions. 10,000 shillings, 2005. Issued 02.01.2006. Green and red on m/c unpt. Musical instruments at left. Owen Falls dam, kudo on back. Like Pick 41 with upgraded security features. “10000” in bottom left corner in magenta to green OVI. “10000” added to existing wmk. of crested crane. New Cornerstone wmk. of diagonal bars in four corners. On back, color of kob (antelope) was bright brown, is now dull brown. Likewise, color of grass was brown, is now green, and the end of horizontal bar below kob was brown, is now green. “TEN” and “SHI” printed in red, with rest of word in green. Printed on high-quality cotton paper with protective coating. Printer: TDLR (w/o imprint). 156 x 76 mm.